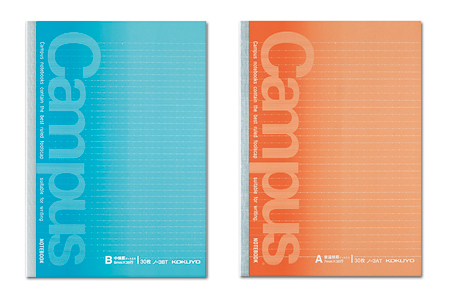 t is obvious that Campus Notebook With Dotting Lines, which has dots on each relued line, is more convenient than normal notebooks. When it is actually in use, it is possible to make more clear not by boxing the titles, arranging the sentences or draw a frame in a open space for graphs and diagrams. It was invented by Kokuyo S&T working together with Bungeishya and Ota Ayako, who noticed that students who pass Tokyo univertity entrance exam write a nicer and neater note and currently writing 'The notes from students who that pass Tokyo university entrance exam are neat and clear'. As a result, they have realized that students who pass Tokyo University try to make their notes more clear and neat so that they can refer to them easier later and from practically using them the beautiful notes were completed without knowing. This is nothing but a work of designing a note page. If how to take more nice and neat note is known, taking notes will become more fun. The level of beauty will also go up by how it's used. From this point of view, one can say that this product which gives rise to creativity.